The arrival of Antonio Conte at Chelsea certainly got many football fans excited, especially those who like to spend time analysing tactics and whatnot. The Italian, often described as a true tactician, started off his Premier League career with a hard-fought win over London rivals West Ham on Monday night, fielding an experienced side in the process. Only fielding two players under the age of 25 (Oscar and Thibaut Courtois) in his starting XI, Conte is apparently trying to push youth to one side at Stamford Bridge, at least for the time being. 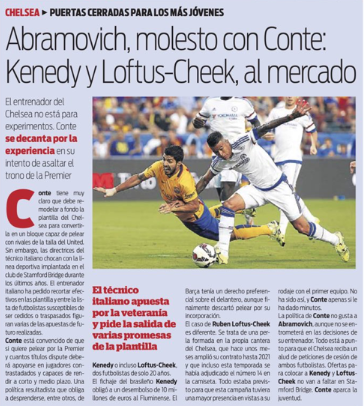 According to Sport in Spain, the former Italy manager would rather send some of his more talented players on loan somewhere else than play them in the first-team, affecting the likes of Kenedy and Ruben Loftus-Cheek in the process. 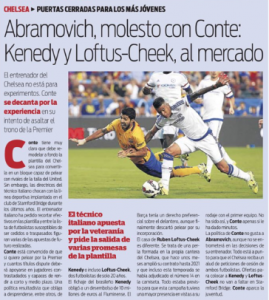 The Catalan newspaper report Roman Abramovich isn’t pleased with this decision, but refuses to get involved directly in Conte’s plans, most likely due to his want to regain the status he feels his club deserves. If that comes through sacrificing youth for a short while, so be it. Conte feels the best way to win titles and games is through experience, meaning loan offers for the two aforementioned starlets are bound to arrive before the end of the month. Kenedy has already been heavily linked with a temporary move to Watford, while Loftus-Cheek, who was on the bench against West Ham, could also end up at a Premier League club.